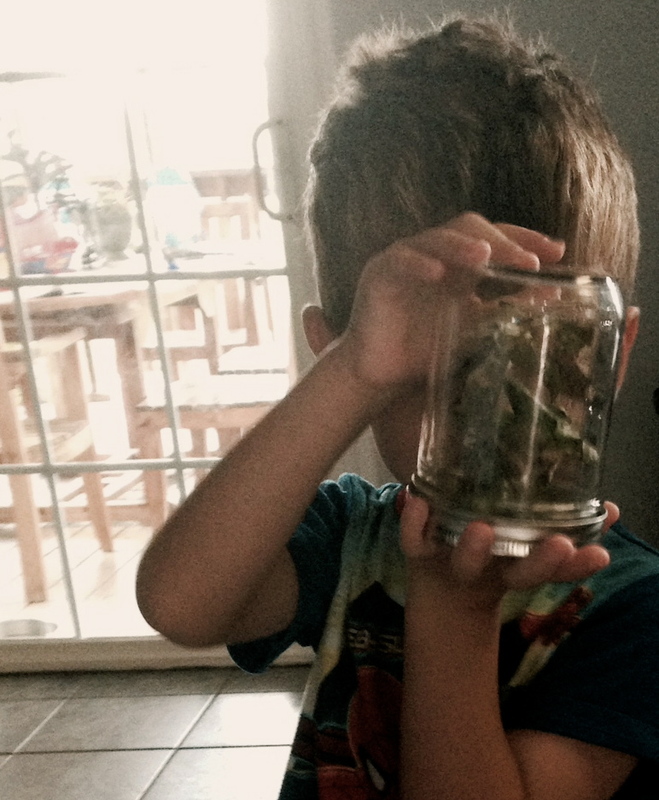 Charlie has a bug jar. I haven’t had a problem with the bug jar so far. In fact, I encouraged it. We would find a cute little ladybug or beautiful butterfly, catch it in the jar, give it some food, and (hopefully) release it the next day after it had spent the night on Charlie’s nightstand. No problem. I know you can’t tell from the picture what is in the jar, so let me tell you. It is a four-inch long green, slimy worm, as big around as my thumb, and it is covered in these weird white spikes. We found it on one of our tomato plants, thinking it the likely culprit for all of the missing leaves. ….and it is so disgusting. It has been sitting on my kitchen counter for 2 days, mocking me with its grossness. I swear I can feel its eyes following me like the Mona Lisa. I don’t know what to do at this point. I don’t want to outright kill Charlie’s little pet, but I also don’t want to release it into the wild. What if it somehow finds its way into the house, and into my bed? I can totally see that happening. But, enough of that. The winner of the 8×10 print from Nicole DiGiacomo Designs is Chloe Joyce! Congrats Chloe! I’ll be in touch so you can get your prize.